She is tall. Taller than the average. Her blond hair is tied in a loose ponytail. She doesn't look up but neither does she look down. Her gaze hangs low suspended by what look like imaginary rigid poles. It could be a useful gaze for someone too scared to talk in front of crowds. But she doesn’t look scared. She looks determined, angry, irritated. She makes her way to the front. The crowd carrying German national flags let her through. Scores of people touch her jacket in that intimate way little girls do when they see Taylor Swift. She nods. Severe and guarded. There is an intimacy in the air of a people who understand each other. A people with a special secret bond. Which makes the whole scenario eerie. I sit upright, determined to get a glimpse of her eyes. Aren’t eyes the pathway to the soul? Aren’t they? Instead, my eyes settle on her eyebrows. Her non-existent eyebrows, ruthlessly carved with an over ambitious pencil. On the stage, someone hands her a microphone. She retrieves a piece of paper from her bag. Her speech. “Did you also lose your appetite listening to Merkel’s speech?” she starts. Her voice is flat and taut. The crowd breaks into a riotous applause. 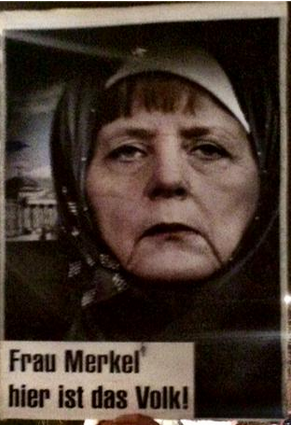 Placards of Angela Merkel wearing a hijab shoot up. ‘Wir sind das Volk!’ Others scream. She raises her head and flashes a guarded satisfied smile. Her eyes remain low. Hateful. Cold hearted racists. Those were Merkel’s words. “Don’t you think you people should try to discuss the issues raised by Pegida?” I tell my friend K. She is German. She stares at me, baffled. Are you kidding? Are you out of your mind? It is also loaded with a silent accusation. You of all the people should know that they are up to no good. 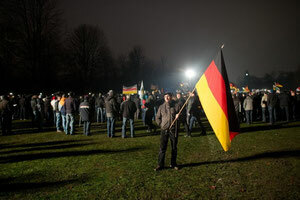 You of all the people, a foreigner in Germany should know better than to give these racists the benefit of doubt. You should know better. But I am not thinking of Pegida. I’m thinking about how ISIS have made child play of human life. About the slaughtered school kids in Pakistan. About Boko Haram in Nigeria. About Al Shabaab. Maybe Pegida members are just scared? I tell her not trusting my voice. She shakes her head violently gazing contemptuously at the screen. It has been seventy years. Only seventy years. Even though she was born thirty five years after it all ended, the legacy lives on. The legacy of a hateful racist people. 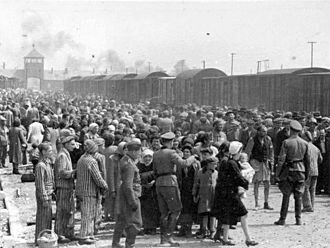 The legacy of a people who looked away while six million of their country men were huddled off to concentration camps and killed. The legacy of a people who did not speak up. You don't know my people. Her eyes seem to say. I gaze into the distance. Amazed at my own level of tolerance. Amazed at my naivety.